dotTech was one of the first, if not the first, blogs to bring you EASEUS Todo Backup ; so it is only fitting that we be the first ones to inform you about the latest release of EASEUS Todo Backup, v2. The ability to perform file-level backups. The ability to create bootable USB drives. The ability to send e-mail notifications upon backup success. The ability to virtualize backup archives by converting them into VMware (.VMDK) or VirtualPC (.VDH) virtual machine formats. The ability to store backups directly on a FTP server. The ability to schedule backups. The ability to set the processing priority of Todo Backup while it is works. The ability to clone partitions. The ability to securely wipe disks or partitions. The ability to perform system-level backups (whole partitions or hard drives). The ability to create bootable CD/DVDs. The ability to compress and split backups. The ability to clone hard drives. The ability to mount/unmount backup archives. The ability to check for backup archive integrity. Todo Backup now has two types of backup: System-level and file-level backup. System-level backup allows users to backup whole partitions and/or hard drives; all the files in the selected partitions/hard drives are backed up and the backup is always a full backup. File-level backup allows users to pick select files and folders to backup; there are filters users can use to help them select particular types of files and users can either do a full backup or an incremental backup. Both system-level and file-level backups are “image backups” – they are stored in .PDB format and can only be restored from within Todo Backup. Only system-level backup archives can be converted to .VMDK or .VHD virtual machines. The Linux-based bootable media is limited in what it can do; it can only restore system-level backups. It cannot create any backups, nor can you use the other features of Todo Backup, like clone hard drive or securely wipe. Todo Backup v1 supported both WinPE and Linux-based bootable media. It appears Todo Backup v2 also supports WinPE and Linux-based bootable media (there is a WinPE folder in Todo Backup’s installation folder) but there is no information regarding how to create this WinPE bootable media. The Linux-based bootable media is created from the “Bootable media builder” located within Todo Backup. When restoring a system-level backup of a partition, you can resize the partition. You can only mount system-level backups; you cannot mount file-level backups. Furthermore, when mounted, you can open/run and use any of the files in the backup; you can also copy them to your real hard drive. However, you cannot modify the files in any way, such as delete, rename, or move them. So, essentially when you have a system-level backup mounted, it is in “read-only” mode. The “Disk clone” feature allows users to migrate from one hard drive to another without having to reinstall the operating system. In other words, “Disk clone” allows you to take the data from one hard drive and put it it on another; and the two hard drives don’t have to be the same size. Update: Do take note that migration from one hard drive to another is intended for hard drives that will be used on the same computer. In other words, this feature isn’t for using the destination hard drive on another computer that has different hardware. Both cloning partitions/hard drives and restoring system-level backups can be done in “sector by sector” mode. Update: It has been brought to my attention that EASEUS Todo Backup v2 uses VSS (Volume Shadow Copy Service) when conducting file-level backups, but it does not use VSS for image-level backups. In terms of performance, I put Todo Backup v2 through a quick test. I had it backup my 10.4 GB partition, which contains 6.01 GB of data. I set compression to maximum but did not encrypt the backup. It took 10 minutes and 34 seconds for the backup to finish while using 35-45% CPU and about 126 MB of RAM (although RAM usage did spike at the beginning for about 10 seconds to 300-350 MB while the error checking was happening; it came down after those initial 10 seconds to the 126 MB level); the backup file ended up being 5.24 GB. When compared to Todo Backup v1, the CPU usage is about the same but RAM usage is significantly higher; and compression is more or less the same but backup speed is a bit quicker. (Also, although not exactly performance related, it should noted the download size of v2 is about twice as large as the download size of v1.) Of course this comparison is just a quick one so don’t take it as the ultimate truth; I will put Todo Backup v2 through more rigorousness tests when I update my Paragon Backup & Restore Free vs Macrium Reflect Free vs EASEUS Todo Backup vs DriveImage XML vs Acronis True Image Home  article. 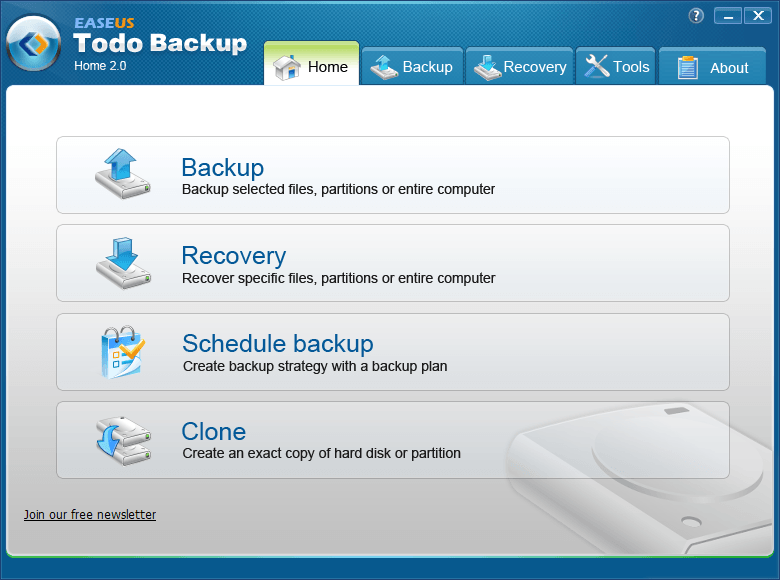 Last but not least, it appears EASEUS Todo Backup is now called EASEUS Todo Backup Home. This probably is an indicator that a shareware EASEUS Todo Backup Professional will appear in the near future.